One of the compensating advantages of the tortuous process by which we nominate presidential candidates is the satisfaction it affords. Those who like to see experts with egg on their faces never are disappointed during presidential campaigns. The first piece of universally accepted expertise to be proved wrong for 1980 is that there can be no such thing as a genuine draft in the era of open primaries and caucuses. The candidacy Senator Kennedy seems on the verge of announcing was not forced upon him wholly against his will. But without the efforts of the draft-Kennedy movement—a loose coalition of liberal union leaders and activists working absolutely independently of Kennedy and his staff—his presidential candidacy, which seemed unlikely in April, would hardly seem so inevitable in October. Early this spring, a group of liberal Democrats believed that Kennedy's changed personal attitude, combined with his great popularity, made his presidential candidacy possible. But they realized as well that without a concerted effort to capitalize on these factors, that candidacy would not materialize. They launched a draft effort because they understood that Kennedy himself wouldn't be the one to set that process in motion, either by acting directly or by encouraging people closely identified with him. Furthermore they knew that the success of Kennedy's presidential race might depend on his manner of entering it. They knew he had to be drafted, and they knew he had to appear to be drafted. By early 1979 it was clear that Kennedy was not running for president. It also was clear that he was not not-running, either. And not-running for president is something Kennedy knows very well how to do. His decisions to stay out of the 1972 and 1976 elections were bigger stories than anyone else's decision to enter them, and he made those decisions unmistakably clear early in the process. His statements of expected support for President Carter in 1980 were not nearly so clear. But they were not a sham. By 1979 Kennedy no longer felt constrained by personal factors to eschew the presidency, but the existence of a Democratic candidate for reelection presented him with a very significant political obstacle. Simply by declaring his candidacy any time in 1979, Kennedy would have become the favorite for the nomination. But he simultaneously would have created a much tougher problem for the final election. The response to such a self-launched candidacy is easy to conjure up. The charges of ruthlessness and arrogance that plagued his brother Robert would have come from across the spectrum. Carter supporters would have portrayed him as an ambitious party-wrecker, unfairly using inherited political support to take advantage of an embattled president. Particularly in the white South, but elsewhere as well, these charges would have hurt. And I suspect—though with no first-hand knowledge—that Kennedy himself had doubts about the propriety of projecting himself into a race against Carter, The brand of complete cynicism that can become the most blinding form of naivete holds that politicians consult only their self-interest in making decisions of this sort. But the nature of Kennedy's Senate career strongly suggests that he would honestly worry about the damage a divisive candidacy would do to the causes that concern him. In any case, whether or not such high-minded considerations governed Kennedy's actions, I know—and here I do speak as a participant—that they dictated the actions of the draft-Kennedy groups. 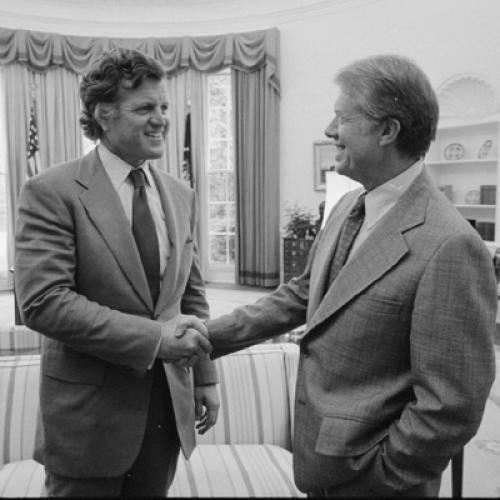 The serious effort to persuade Kennedy to run for president probably began with the 1978 midterm Democratic convention at Memphis. The narrow White House victory at Memphis over the resolution calling for great federal spending for social and economic purposes confirmed two things: President Carter was significantly more conservative than the traditional Democratic position on domestic policy; and he had failed to pull the base of the party to the right with him. That a sitting president barely avoided repudiation by his own party's convention on a basic issue, after an all-out lobbying effort, meant that the ideological basis for a challenge existed. It is particularly significant that the split came over this gut domestic issue. Dissent at Memphis was not over busing or affirmative action or abortion or foreign policy. The liberal-labor coalition that came apart in 1967 fighting one Democratic president came together 10 years later to fight his Democratic successor. Many of the leaders of the anti-Carter position at Memphis—William Winpisinger and the Machinists, Leon Shull of ADA, Michael Harrington of the Democratic Socialists—stayed together informally to work for a Kennedy candidacy. When Carter then submitted the most conservative budget offered by a Democratic president since World War II, these and other liberals became convinced that an alternative Democratic candidate was a necessity. This did not lead to unanimous agreement on Kennedy as that candidate. For much of early 1979, liberals sat around and asked one another who they could support as a progressive challenger to Carter, Kennedy was obviously the preferred choice, but no one knew if he would run, nor did anyone have any way of finding out. Some thought it was a mistake to enlist the troops on behalf of a reluctant standard-bearer. This, plus uneasiness about Kennedy among some women's groups, and the inevitable lack of agreement about anybody or anything to be found in any ideologically motivated group, might have led to a focus on some other candidate, except for one problem: no one could think of any. THE ONE WILLING Carter challenger, Governor Brown, had almost no support among these groups. Especially after his inauguration day embrace of a constitutional amendment for a balanced federal budget, mention of Brown generally served only to provoke rare kind words for Carter in these circles. There were political figures for whom many of the dissidents felt respect and affection, such as Morris Udall and John Culver. But no one involved in the effort to challenge Carter for the Democratic nomination felt that these men would have any chance of success. And while some individual ADA leaders, the political arm of the Machinists, and other liberals talked strategy in Washington, spontaneous pro-Kennedy groups were sprouting around the country—particularly in such key early states as New Hampshire, Florida, and Iowa. By April, a consensus had emerged around the difference between Kennedy's adamant non-candidacy of 1972 and 1976, and his less categorical position in 1979. The drafters decided to assume that Kennedy would be willing to challenge Carter if he were genuinely drafted to do so. Precisely because of the breadth of Kennedy support, there was never one draft-Kennedy organization, and many of those most active in the effort never met each other. But there were overlapping informal conversations and meetings among the major groups: the Machinists; ADA after its June endorsement; representatives Richard Nolan, Richard Ottinger, Pete Stark, and Edward Beard; Victor Kamber and his allies; and the various state groups, especially those in Florida, Iowa, and New Hampshire. They decided against forming any one organization which might force Kennedy to respond prematurely, and trigger more restrictive federal election law rule. Instead, all of the nationally based groups kept beating their own drums, while offering as much assistance as they could muster to the draft-Kennedy groups in the key state. Thus, for example, Massachusetts ADA agreed to raise funds for the work of Dudley Dudley and Joanne Symons in New Hampshire, while New York Kennedy supporters raised money for Kennedy supporters in the upcoming Florida convention. The Machinists were deeply involved in Iowa, as well as in the other states. While the drafters did their work, outside events helped them. The economic downturn and the prospect of skyrocketing home heating costs further weakened Carter, as did his extraordinarily inept and politically damaging handling of the Andy Young affair. Whatever doubts Kennedy himself had about the moral legitimacy of his challenge to Carter had to erode as Carter's own performance made his reelection seem less and less likely. The biggest boost to the draft-Kennedy effort in the early summer almost certainly came from other Democratic office-holders, particularly in Congress. Sympathy for Carter's political troubles in 1978 has turned by 1979 into a growing fear that his problem is highly contagious. By June 1979 it was clear that many Democratic senators and congressmen dreaded running in 1980 on a Carter ticket. The pleas addressed t Kennedy by ideological liberals to do battle for his political values were now greatly reinforced by the calls for political help from his colleagues. By summer the view was widely shared that a Kennedy presidential candidacy stood in roughly the same relationship to liberal Democrats as the Seventh Fleet to the Vietnamese boat people. In April I heard one senator from the far West and farther right tell a fellow conservative that their chances to beat Frank Church for reelection were reasonable if Carter ran again, but would be very slim if Kennedy headed the Democratic ticket. The final factor putting pressure on Kennedy was that he was being thrust into the race willy-nilly. It's true that in most states a candidate cannot be placed on the presidential primary ballot against his or her will. But in almost every state there is a way for an unwilling candidate's partisans to make some show of support. In caucus states, the candidate's permission is not needed. In some primary states, write-ins are technically and politically possible. In others, formally uncommitted slates can announce and campaign on their allegiance to a particular candidate. With the Florida convention approaching, and Iowa and New Hampshire not too far behind, Kennedy faced the prospect of having his presidential appeal tested in a haphazard way while he was still professing support for Carter. Of course Kennedy could have put an end to all this by another Shermanesque denial. But only the most absolutely worded refusal to run in 1980 would have headed off the burgeoning draft movement, fueled by a strong outpouring of rank and file support. Then, if Jerry Brown were to defeat Carter in a series of early primaries, or if some other political disaster beset our disaster-prone president, Kennedy would have found himself severely handicapped in responding. Moreover, by August there could be no doubt in Kennedy's mind or anyone else's that the draft effort was genuine. Carter had moved significantly to the right domestically, without in any way increasing his chance for reelection; Democratic activists, union leaders, and his congressional colleagues all were pleading for his help. A refusal by Kennedy to run this year—making him, numerically, the Harold Stassen of non-candidates—may well have convinced people that he had finally abandoned any interest in the presidency. The drafters seem to have succeeded in two important ways: Kennedy is about to become a candidate; and he does so in circumstances that make it very hard to paint him as a self-seeking party wrecker. It is hard to see how he can be denied the nomination. The basic fact of the 1980 Democratic nomination contest is that Kennedy is the preferred candidate of the great majority of Democratic-voters. This is what the polls say. In a traditional primary situation, polls can be undependable for two reasons. First, because candidates are generally not well known at the outset of the process, public opinion can be expected to change rapidly as the candidates increase their exposure. Second, given the erratic turnout rates of primary voters, a candidate supported strongly by a committed minority can overtake one with more desultory backing from a larger group of voters. But in today's Democratic party neither factor is at work. Kennedy and Carter begin this race better known than many candidates are when they are nominated. The most committed supporters in this race—both in ideological fervor and in allegiance to their candidate—belong to Kennedy, not to Carter. Since economic conditions will get worse before they get better, and people are about to pay far more to heat their homes in the coming winter than they ever imagined possible, it is very hard to see how Carter can reverse Kennedy's big popular lead. It's hard to imagine what successful strategy Carter can employ. One argument that is often available for the candidate who is opposed by his party's ideological core is that he has greater appeal to the moderate center as a candidate in the general election. The trouble confronting those who wish to use that argument on behalf of Jimmy Carter against Ted Kennedy is that no one believes it. After all, the widely held view among non-ideological Democratic officeholders that Kennedy is a far stronger candidate for November is one factor that helped persuade Kennedy to run. From Kennedy's standpoint, November 1980 is not the best time to test his presidential chances. The fight for the nomination will add new political scars to those he already bears. And the public skepticism over federal government initiatives and concern about inflation offer the Republicans a natural campaign against him. But given the public mood about politicians in general today, it's probably not a good time for anyone to run for president. And somebody has to. This article originally appeared in the October 6, 1979, issue of the magazine. Photo Credit: Wikimedia Commons.